Leading restaurant furniture supplier supplies Illinois restaurant with premium restaurant chair and tables. Leading restaurant furniture manufacturer and distributor Affordable Seating recently helped Saray Grill in Des Plaines, Illinois to a triumphant grand opening with high quality attractive metal chairs, table tops and table bases. Saray Grill serves Balkan cuisine and dishes from Bosnia. For appetizers they serve cold cut platters with smoked beef, Bosnia sausage and feta cheese. Other appetizers include grilled mushrooms with kajmak, a homemade Bosnian cream cheese and smoked beef. They also serve goulash, vegetable soup and salads such as chicken salad and shopska salad. They also serve calamari, chicken wings, chicken sandwiuches and nuggets as well as pizza.They offer ethnic Bosnian dishes such as cevapi, chiken & beef kebab, grilled tilapia, and Bosnian pitas. 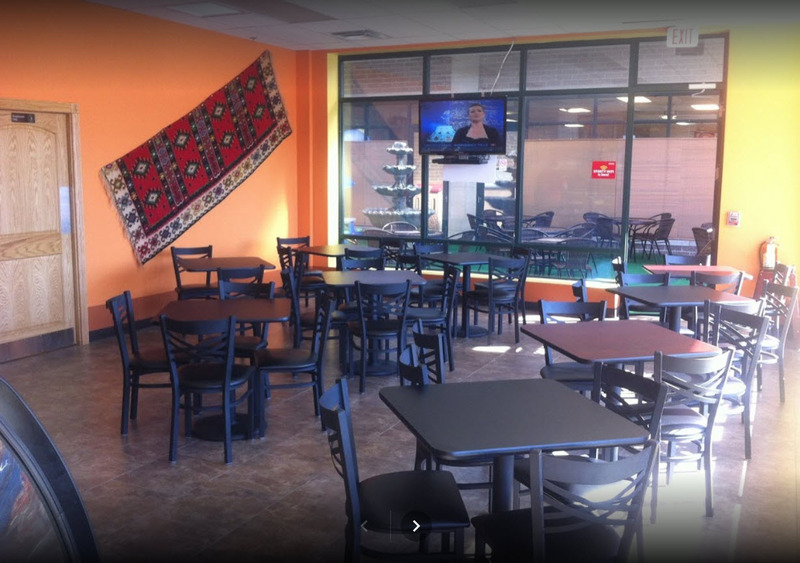 “As a venue that brings in a wide variety of customers and experiences heavy traffic every day, the owner of Saray Grillwas looking for new, stylish chairs that would help make a statement and also last a long time,” Affordable Seating sales representative David M. explained. A matching Metal Cross Back Bar Stool is also available and currently sells for only sell for only $47.99. The commercial metal chair comes with a standard black sandblast frame finish, plastic glides and a padded seat. The frame is available in 5 different finishes. Customers have the choice of a solid wood seat or an American made padded seat made of fabric or vinyl. The wood seat is available in 6 different finishes and for an upholstered seat there are many options to choose from. The owner chose chairs and bar stools with black frame finish, with padded seats upholstered in green vinyl. The Metal Cross Back Chairs and Bar Stools are the most popular choices for restaurants and bars. They are stylish and versatile enough for any type of establishment. They are also very tough and durable, which makes them a great choice and a wise investment. All of Affordable Seating’s products come with a limited lifetime warranty. For tables the owner bought Affordable Seating’s Reversible Table Top in mahogany and black finish with black t-mold edge. The Reversible Table Top also comes in oak and walnut with brown t-mold edge. “The Reversible Table Top is popular with all kinds of restaurants across America because they are so versatile and affordable” remarked David. The table tops come in many shapes and sizes. Prices for the Reversible Table Top start at $22. To view Affordable Seating’s full selection of restaurant chairs, bar stools, booths, tables and patio furniture visit http://www.affordableseating.net or call a customer service representative at (888) 495-8884. Saray Grill is located at 1051 S. Elmhurst Rd. in Des Plaines, IL. They can be contacted at: (847) 258-3631.